Islam quite clearly reglamentary not only religious but also secular lives of their adherents. For example, a Muslim have to follow the rules and customs of his religion in thought and in life. The behavior of a Muslim should depend on who she is at the moment. In front of others men it should behave strictly and modestly. It is expressed primarily in the form of clothing - all parts of the body of the Muslim woman except face and hands must be covered. Not welcome fitted styles, translucent fabric, overly bright makeup and manicure. You also need to control their behavior. You should not flirt with men to lead them to explicit conversations. Also, many Muslim scholars do not approve of a situation when a woman is alone with a man not related to her relatives. The woman in Islam is not obliged to be a recluse. It can work with the consent of her husband and family, to go out, but the most preferred is considered the company of other women. You also need to consider that a Muslim is undesirable to visit places associated with alcohol consumption and other actions not relevant to Sharia. Since this is not always possible in non-Muslim countries, the woman's behavior in a particular situation should be regulated in terms of following reasonable religious requirements. In the family and women's groups Muslim can behave more openly. At home a woman can dress up brightly, and specifically for my husband - even wearing revealing outfits. By itself, the care, the selection of beautiful clothes is not frowned upon, except when it is directed to the seduction of strange men. Within the family the woman should respect the opinion of the first father and then husband. A woman can choose her husband as the family Council, and independently, however, it is important to avoid proximity to marriage and choose a spouse in Muslim. 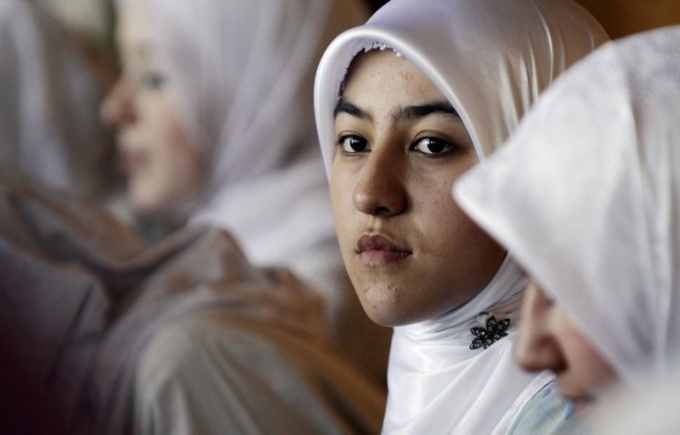 For Muslim women it is desirable to resolve family problems in a peaceful way, however, in the case of irreconcilable differences it might appeal to religious authority, and even in some cases to request a divorce from her husband. Divorce in Islam is possible, but not encouraged. Another important aspect of the family is polygamy. The Koran allows a Muslim to have up to four wives, to which he should be treated equally. A Muslim woman, in turn, should live peacefully with the other wives of her husband, restraining his jealousy. An important part of the proper behavior of a Muslim is considered a religious observance. As menand women in Islam must pray 5 times a day, but women do not necessarily need to go to the mosque, prayers can be made at home. A Muslim is responsible in imparting their religion to children. Although boys and often girls from religious families attend school at the mosque, the parents have to serve them a daily example of correct from the Islamic point of view of conduct and of worship.